Last Saturday, on October 14th, I went to discover wines at the Slow Wine Event in Montecatini Terme in Tuscany. This is the event where they present the yearly Slow Wine Guide. This wine event is an amazing opportunity to taste “slow wines” from all over Italy. Furthermore, while you are sipping and talking to wine producers you are in a beautiful setting at the Tettuccio Terme in Montecatini. It is also a chance to meet wine producer friends as well as other friends and hang out. 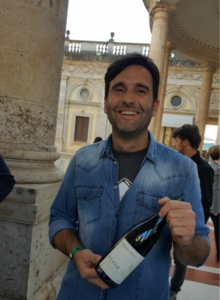 It was indeed very nice to see some of the producers from Puglia again, that I met in June at the event Radici del sud. Girolamo, Anna, and Cesare from d’Araprì winery in San Severo were there. Their Brut Riserva Nobile 2013 is in the Slow Wine guide as a Vino Slow. They were guests at my WinesOfItaly LiveStream a couple of weeks ago. 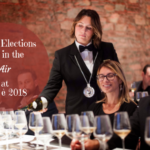 Others were Luigi from Antica Enotria with his Nero di Troia 2013, Valentina Passalacqua with her Cosìsono 2014, Marianna from Agricole Pietraventosa with their Volere Volare 2015, and Gianfelice from d’Alfonso del Sordo with his Dammirose 2016. 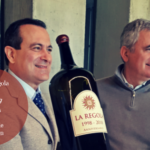 Read more about these wineries in my article One Big Wine Family – The Essence of Radici del sud in Puglia. This year, I decided to try and taste mostly wines from producers that I did not know or at least had never tasted before. Also, because, what’s the fun in tasting things you already know when you have a selection of 400 wines from all over Italy…right? The first Slow Wine Guide came out in 2011, so this guide, i.e. the next year’s guidebook, will be the 7th edition. It is published by Slow Food Editore, the publishing house of the association Slow Food. The association Slow Food was founded in 1986 and soon thereafter, in 1990, it started its own publishing house. The aim was to be able to publish books on themes that lie close at heart to the association’s ideals. Not only food-related subjects but also wine was, of course, important for Slow Food. For several years, the edition Vini d’Italia was published in collaboration with Gambero Rosso. 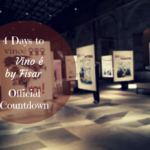 Then came Slow Wine…In 2014, the collaboration between Slow Wine and Fisar had its beginning. Fisar is one of the main Italian sommelier associations. This symbol is awarded to a winery for its way of being in line with Slow Food’s organoleptic, territorial, and environmental values. From 2017, this award also means that the winery is not using chemical pesticides in the vineyards. The wines produced by these wineries also have a good price-quality relation. This is awarded to a winery that has presented wines with a very good average quality to the Slow Wine selection tastings. This symbol is given to a winery that has a good price-quality relation for all the bottles it has presented to the Slow Wine selection tastings. This is awarded to a wine bottle with an excellent organoleptic quality, that also manages to give an expression of the typical traits of territory, history, and environment. It also means that no pesticides have been used in the vineyards of the producer. Last, but not least, it also has a good price-quality relation. A wine having optimal organoleptic qualities. Now, I tasted more wines than these five, however, I am sorry I cannot mention them all here. Therefore, I have chosen five wines I tasted for the first time last Saturday to write about here. Marco Carpineti is an organic and to a certain extent biodynamic winery situated in Cori, in the province of Latina. This sparkling wine, Kius, that I tasted is made with Bellone which is an indigenous grape variety in Lazio. Bellone has historically been cultivated in the area of Castelli Romani and around Cori. Bellone is a grape that likes volcanic and limestone soil. It is possible to produce dry, sweet, and sparkling wines, due to its good acidity, with this variety. The Brut Kius 2014 is a fresh and fruity sparkling wine where you also feel the minerality and a hint of yeast. I really enjoyed this sparkling wine and I will definitely drink it again. Here you can hear the winemaker talk more about his wine. Sorry, the video is in Italian and not English (and for keeping the camera too low in the beginning. Too focused on tasting the Brut Kius 😉 ). Damiano Ciolli is an organic winery located in Olevano Romano which is a medieval hamlet just south-east of Rome. They cultivate Cesanese d’Affile which is a grape variety that dates to the Roman era. There are two varieties of the Cesanese grape, namely Cesanese Comune and Cesanese d’Affile. The latter one is considered to be of higher quality and even though it prefers high altitudes and ripens later, many producers have chosen this variety. Damiano Ciolli’s Cesanese Silene is an Olevano Romano DOC wine. This is a fresh, fruity, very enjoyable and yet elegant wine. I had wanted to taste this wine for some time, and I was very happy to be able to do so at Slow Wine. Cantina Cavalieri is an organic winery in Matelia in Le Marche that dates back to the early 20th century. The estate comprises 8 ha (20 acres) of vineyards where they cultivate mainly Verdicchio and a smaller amount of Merlot, Pinot Noir, and Sangiovese. Verdicchio can be found in two different denominations in Le Marche, namely Verdicchio dei Castelli di Jesi DOCG and Verdicchio di Matelica DOCG. 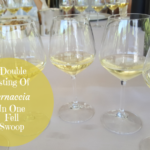 Verdicchio di Matelica has generally a higher acidity level and are more full-bodied than Verdicchio di Jesi. A characteristic that both have is the note of sweet almonds that often also ends with a bitter aftertaste. This Verdicchio di Matelica d’Antan is a full-bodied, fresh and mineral white wine with notes of fruit and herbs. Furthermore, it has neither been clarified nor been filtered. A very interesting Verdicchio wine. La Cappuccina is a winery with 40 ha (98 acres) of vineyard in Costalunga di Monteforte d’Alpone (the province of Verona) that is organic since 1985. The winery was founded already in the late 19th century, so there is a lot of history here. Garganega is one of Italy’s oldest and most important grape varieties. It is a grape with notes of white flowers, citrus fruits, apricot, and apple in general if it is matured in steel and not in oak. Garganega is also a grape that gives wines with an important aging potential. This Soave Doc is a 100% Garganega wine with notes of flowers and peach followed by a slight aftertaste of almonds. While I was sipping on the wine I was chatting to Elena who described the wine to us as you can see below. Casalpriore is a small winery that has been in the hands of Gabriele Ronzoni and his family since 1987. In the Slow Wine guide, this winery is defined as one of the small artisan winemakers in the Lambrusco area that are carrying forward an important heritage. 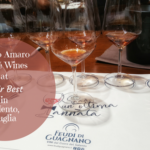 This winery is located in San Martino in Rio, which is in the province of Reggio Emilia. 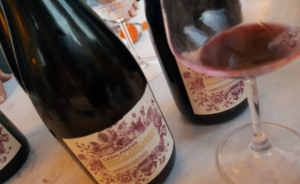 In my (re-)discovery of and love for wine in Emilia-Romagna lately, I decided to focus part of my tasting in Montecatini Terme at these wine producers. I found Gabriele Ronzoni to be a very kind man and I really enjoyed his Lambrusco Stilorosso. Stilorosso 2016 is produced with a blend of Lambrusco Salamino, Lambrusco di Sorbara, Lambrusco Ancellotta, and Lambrusco Oliva. The winery is organic, the use of sulfites is reduced, and the wine does a refermentation in the bottle. The wine has a beautiful ruby red color and adorable notes of red fruit such as blackberry and blueberry followed by a more floral hint of violet. 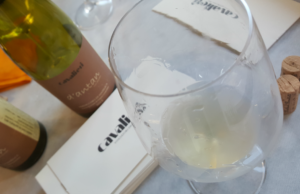 The beauty of attending wine events such as the Slow Wine presentation in Montecatini Terme with lots of smaller wine producers too, not only larger and more well-known ones, is that you can discover new things. So, in the header above I mean new wines in the sense of wines I had not tasted before. Many of the producers I knew about already, but I had not had the occasion to taste them yet. Thanks for sharing your wine tasting experience at Slow Wine. We’re always trying to learn more about wine and really appreciate your writing and your knowledge. Sipping wine at a Tuscan wine event sounds like a dream! We’ll keep following. Hi Michele, thank you for your comment. I am happy you liked the article about Slow Wine. And, yes, it was a fun wine tasting there.